This post comes from Daniel Reisner, a graduate student at the Palmer School of Library and Information Science. Daniel interned at the Taminent Library this past spring semester, dividing his time between helping me process the CPUSA records and helping Hillel process the Daily Worker photograph morgue. During the recently concluded spring semester, I was fortunate enough to serve as an intern at the Tamiment Library, assisting on two projects connected with the Communist Party USA papers. The first project involved processing a small portion of the collection’s administrative files. The second concerned identifying and describing items from the Daily Worker/Daily World photograph and negative collection. Like many students entering the archival field, I previously studied history. My experiences working on this collection were a reminder of the importance of preserving the past and provided an education about the hard behind-the-scenes work archivists perform to make collections usable and intellectually coherent. When completed, the arrangement and description of the CPUSA papers will enable researchers to provide context and life to people and movements from a different era. Part of the CPUSA collection consisted of information chronicling the Party’s relationship with the FBI, in particular, COINTELPRO or “Counterintelligence Program”. From 1956-1971, the FBI authorized electronic bugging, misinformation campaigns, media exposure, the planting of informants and other tactics designed to monitor and sow discord among Party members. The CPUSA papers contain internal memos from the FBI obtained through the Freedom of Information Act (FOIA) that detail these efforts and include proposals for future operations, progress reports of ongoing campaigns and evidence of their work. 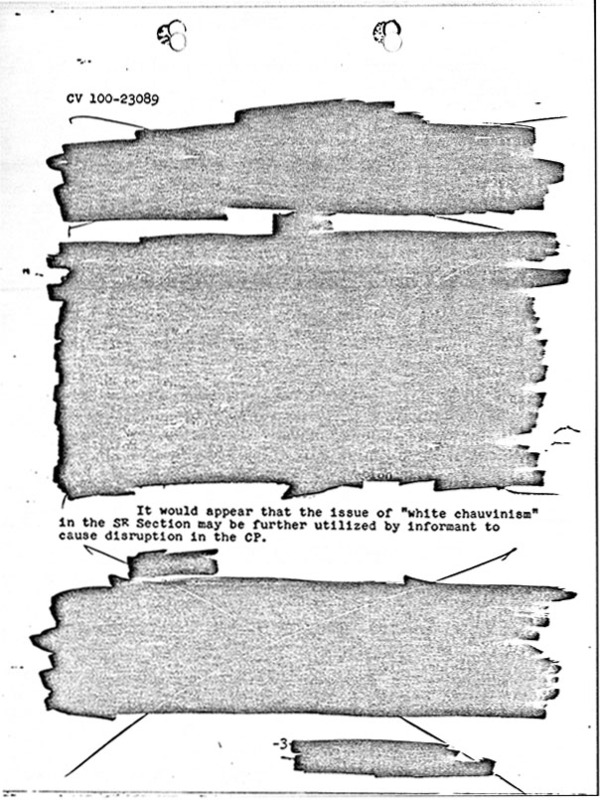 The files are arranged by field office, so researchers can get an idea about the activity of the CPUSA across the country, despite the many redactions. When I initially read through some of the reports, my first reaction was that many of the FBI’s methods, such as mailing anonymous letters alerting neighbors to the Communists next door, or letting a Party member know that a fellow traveler was having an affair with their spouse, seemed rather silly and minor. Additional efforts included sending newspaper articles about anti-Semitism in the Soviet Union to Jewish Party Members. 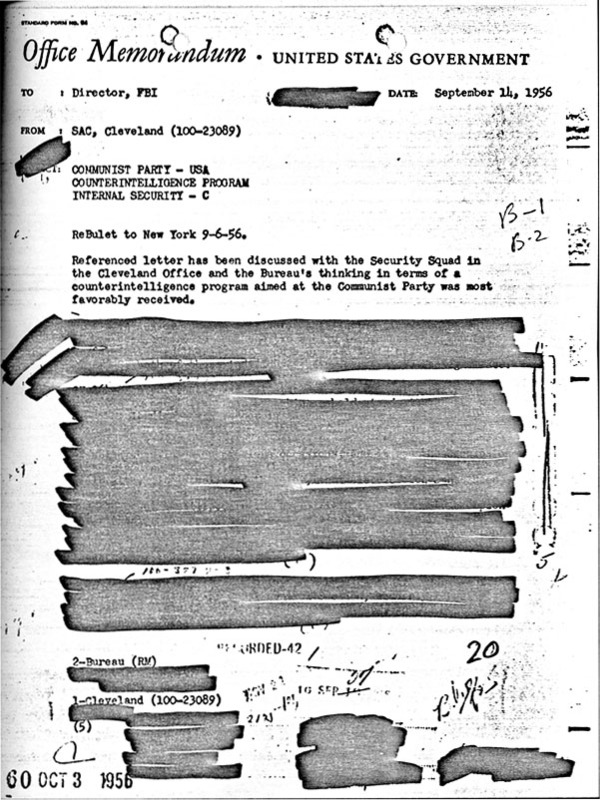 The CPUSA papers also included the Party’s reaction to suspected Government intrusion and its efforts to piece together COINTELPRO initiatives after the program was exposed to the public. These documents add context to the FOIA files and demonstrate just how serious and effective the FBI’s program actually was. Party members were expelled erroneously, planned rallies were cancelled and resources were wasted. The Party was either made to look like a threat or ineffectual, which had a negative effect on Party morale and their ability to recruit new members. The documents also show how proficient the FBI was in sending anonymous letters so they could not be traced back to them, planting stories in the press and pressuring people to inform. The FOIA files are interesting in their own right, but the revelations of how the CPUSA reacted provides unique context and insight into the historical period to show how each side viewed the other and themselves. The FBI considered their actions as necessary to disrupt a serious internal threat to the country’s security, while the CPUSA interpreted the FBI’s actions as unconstitutional abuses of power aimed at curbing lawful dissent and association. The CPUSA papers shed light on an important period in American history and should provide researchers plenty of opportunities to expand our current understanding of the Party and its place in political history. I would like to thank Jillian and Hillel, for their patience and help during my internship. I am excited to see the finished product of all their hard work in the near future. Is it possible to get old copies of the Daily worker? My great grand father was the editor c.a. 1940. Brad, I am writing a book on the CPUSA. Who was your great grandfather?